Text of ICANN announcement : Administrator of Domain Name System Launches Global Multistakeholder Accountability Process | ICANN. ICANN has launched a process to transistion the role of the US Government relating to the Internet’s unique ICANN’s announcement comes on the heels of an historic announcement today by the U.S. Government stating that it is ready to transfer its stewardship of the important Internet technical functions to the global Internet community. The U.S. Government’s current responsibilities to be transitioned include the procedural role of administering changes to the Domain Name System’s (DNS) to the authoritative root zone file – the database containing the lists of names and addresses of all top-level domains – as well as serving as the historic steward of the unique identifiers registries for Domain names, IP addresses, and protocol parameters. In doing so, the U.S. recognized ICANN’s maturation in becoming an effective multistakeholder organization and requested that ICANN convene the global community to develop the transition process from of the U.S. stewardship to a global community consensus-driven mechanism. Independent of the U.S. transition, the roles of the Internet technical organizations, including ICANN’s role as administrator of the Internet’s unique identifier system, remain unchanged. The Internet’s Unique Identifier functions are not apparent to most Internet users, but they play a critical role in maintaining a single, global, unified and interoperable Internet. The first community-wide dialogue about the development of the transitional process will begin March 23-27 during ICANN’s 49th Public Meeting, in Singapore. All global stakeholders are welcome to participate in person or remotely.identifiers system. A Model for Exploring WHOIS Accuracy. ICANN’s At-Large Community is beginning a search for an appointee to the ICANN Board of Directors. ALAC is looking for someone with a broad international perspective and a background in Internet users’ interests, consumer policy and/or civil society worldwide. A so-called Expressions of Interest will remain open for those interested in the position through December 26, 2013. This is the first step in a process through which ICANN’s independent user community will appoint a voting member of the Board. “The process is different because, by its nature, the At-Large community is looking for new people who are interested in participating in the Internet governance process and are coming from the civil society, the user community and so on,” said Roberto Gaetano, a non-voting former ALAC liaison to the Board. “The qualification is basically to have an ethical attitude. We demand a moral standing and the ability to discuss freely, along with the ability to understand the different cultures”. * Guidance on how to run Internationalized Domain Names (IDNs). * How to introduce new gTLDs (such as .eco, .green and IDN TLDs). * How to implement a stable and fair transition from IPv4 to the next Internet addresses generation, IPv6. Those who wish to be considered for the ALAC Board position must complete an Expression of Interest form at: https://www.bigpulse.com/p26527/register. Completed application forms must be received by 23:59UTC on 26 December 2013. If you want to understand more about ICANN At-Large community, please also contact Dev Anand Teelucksingh, vice chair of the Trinidad and Tobago Computer Society (TTCS ; http://ttcs.tt/). The Trinidad and Tobago Computer Society is an member of the At-Large Community and Dev Anand is currently serving as a member of the At-Large Advisory Committee (ALAC) and on the ALAC Leadership Team. The Internet Corporation for Assigned Names and Numbers 48th public meeting begins this Sunday November 17th to Thursday November 21 2013. The full meeting schedule can be viewed at http://buenosaires48.icann.org/en/schedule-full. Each meeting on http://buenosaires48.icann.org/en/schedule-full has a link to aseparate meeting page (for example, the ALAC and Regional Leadership Working Session 1 meeting at http://buenosaires48.icann.org/en/schedule/sun-alac-regional) has remote participation details and the agenda that allows anyone with a broadband connection to attend the live sessions and participate. There are several meetings during the ICANN 48 Buenos Aires meeting with a significant focus on Latin American and the Caribbean. This guide explains how policy advice is developed within the At-Large Advisory Committee (ALAC), why it is important to the end-user, and how you can make your voice heard within that process. The Internet Corporation for Assigned Names and Numbers 47th public meeting begins this Sunday July 14th to Thursday July 18 2013. Each meeting on http://durban47.icann.org/full-schedule has a link to aseparate meeting page (for example, the ALAC and Regional Leadership Working Session 1 meeting at http://durban47.icann.org/node/39587 ) has remote participation details and the agenda that allows anyone with a broadband connection to attend the live sessions and participate. The Trinidad and Tobago Computer Society (TTCS) is an accredited ICANN At-Large Structure (ALS) and a founding member of the Latin American and Regional At-Large Organisation (LACRALO), comprised of 42 At-Large Structures in 16 out of 33 countries in the Latin American and Caribbean Region. At-Large is the name for the community of individual Internet users who participate in the policy development work of ICANN. The vice-chair of TTCS, Dev Anand Teelucksingh is currently serving on the At-Large Advisory Committee (ALAC). The ALAC is responsible for considering and providing advice on ICANN’s activities as they relate to the interests of individual Internet users (the “At-Large” community). Interested in learning and getting involved in policy issues related to domain names included new generic Top Level Domains and IP addressing? ICANN, the Internet Corporation for Assigned Names and Numbers is a private sector, non-profit corporation with technical management responsibilities for the Internet’s domain name and address system. It consists on a number of groups representing various interests. 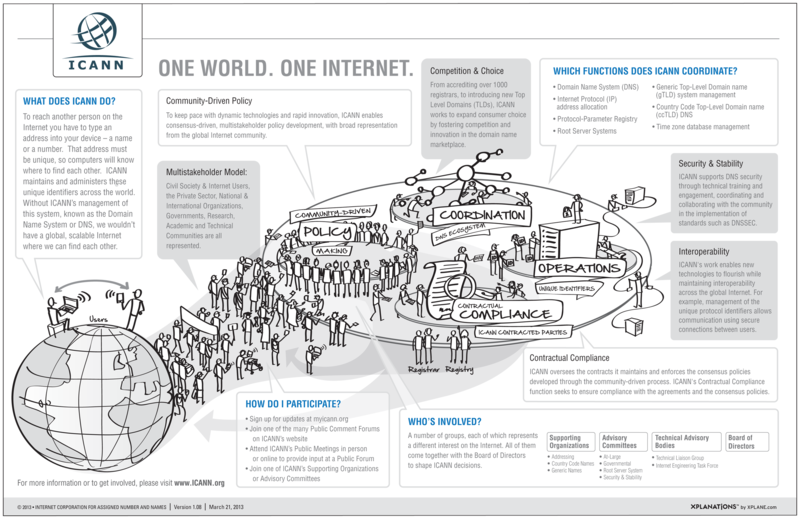 See http://www.icann.org/sites/default/files/assets/ecosystem-2500×1622-21mar13-en.png for an illustrated overview. A Latin American and Caribbean Steering Committee (LAC Steering Committee) comprised of regional stakeholders in various ICANN groups (https://community.icann.org/x/g4REAg) was created after the ICANN Toronto meeting (http://blog.icann.org/2012/10/latin-america-and-the-caribbean-a-regional-strategy/) to discuss a possible ICANN strategy for the LAC region. A draft of this Latin American and Caribbean (LAC) Regional Strategic Plan is available for review and comment in English (PDF ; 2MB) and in Spanish (PDF ; 2MB). some possible indicators to measure progress (or lack thereof) of projects undertaken to support the Strategic Plan. The Trinidad and Tobago Computer Society (TTCS) is an accredited ICANN At-Large Structure (ALS) and a founding member of the Latin American and Regional At-Large Organisation (LACRALO), comprised of 37 At-Large Structures in 15 out of 33 countries in the Latin American and Caribbean Region. At-Large is the name for the community of individual Internet users who participate in the policy development work of ICANN. There are several representatives from TTCS participating in ICANN At-Large. Each meeting on the http://dakar42.icann.org/full-schedule has a separate meeting page (for example, the ALAC and Regional Leadership Working Session 1 meeting at http://dakar42.icann.org/node/26789 ) has remote participation details and the agenda. The audio of many of the ICANN At-Large meetings are streamed in English, Español, Français and Português. UTC. For persons in Trinidad and Tobago, Dakar, Senegal is 4 hours ahead of the time in Trinidad and Tobago.